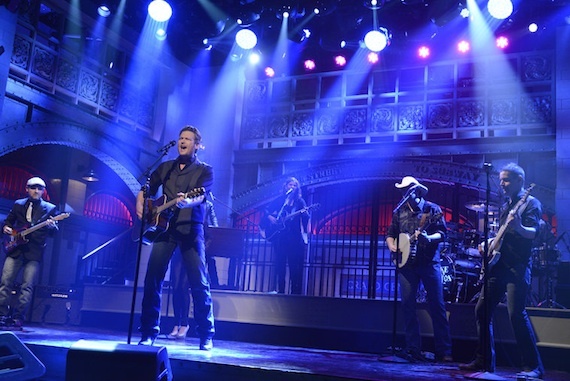 Though Blake Shelton‘s first gig as host and musical guest of Saturday Night Live (Jan. 24) may have drawn mixed critical reviews, the episode was a ratings success. SNL drew a household rating of 4.7 in 56 markets metered by Nielsen Media Research, with a 2.2 among adults 18-49 in the 25 markets with Local People Meters. The ratings increased 15 percent (household) and 10 percent (demo) from last week’s show, hosted by Kevin Heart, with musical guest Sia. Shelton’s SNL episode is (so far) the season’s second-highest rated in metered-market households, behind the Nov. 1 episode hosted by Chris Rock, with Prince as a musical guest. In addition to hosting and performing songs including “Neon Light” and “Boys ‘Round Here,” Shelton, along with Aidy Bryant and Kate McKinnon, playfully mocked several country music cliches with a parody video of “Wishin’ Boot” (see video below). He also spoofed The Bachelor, and took part in a “celebrity version” of “Family Feud,” with cast members portraying judges from The Voice and American Idol.